Creating an infrastructure to support the blue economy is critical to the success of Ireland’s integrated marine plan, Harnessing our Ocean Wealth. A key infrastructural element to support the maritime sector will be officially activated tomorrow (Friday, 1st July) at the Our Ocean Wealth Conference when the SmartBay Subsea Observatory will begin feeding data from the seabed to businesses, researchers, scientists and policy makers. The event focused on Ireland's digital ocean opportunity highlighting how technology companies can drive new forms of innovation in the blue economy. It featured insights from a number of companies from the technology sector including IBM, Ericsson, Cathx Ocean, Intel, Teledyne Oil and Gas, SAP, IMERC, MARS Innovation Centre NOC UK, SFI MaREI Centre, Hewlett Packard Enterprise, Wood Group Kenny, OpenHydro, JFC Marine, Technology from Ideas, SeaPower, CadFem, Commissioner of Irish Lights, SFI Research Centre CONNECT, SFI Research Centre Insight, Deloitte, demos from SonarSim, Techworks Marine and others. 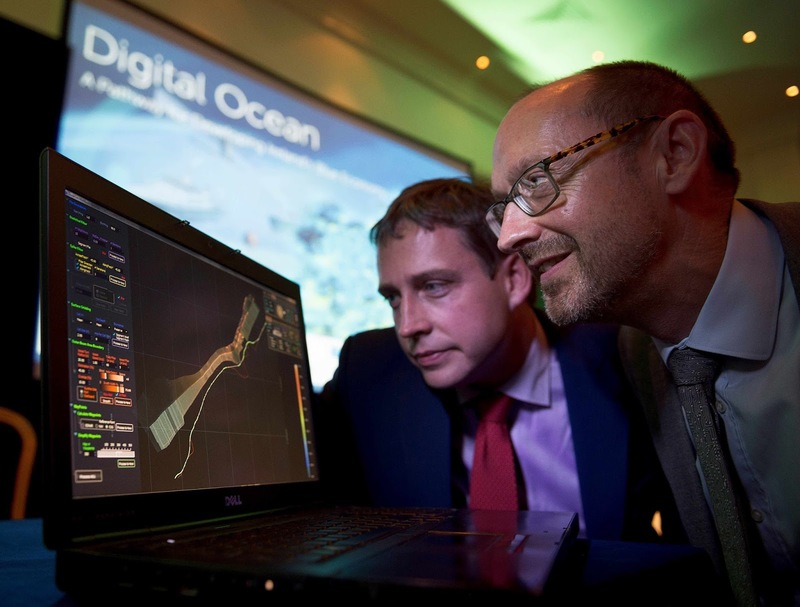 The Digital Ocean represents Ireland's opportunity to drive innovation in the collection, communication, management and analysis of marine data for commercialisation, research, economic growth and societal well-being. Ireland has existing expertise across a number of the key enabling technologies required to develop products and services that will support growth in emerging areas of the global blue economy while creating efficiencies and supporting sustainability across more established markets. Expertise in areas such as sensors, platforms, communications, robotics, informatics, computer vision and advanced materials can be harnessed in new ways to drive innovation in global marine markets with high growth potential. This will also support the sustainable development of our significant marine resource that is uniquely situated on the European Atlantic seaboard and a potential hotspot for developments in areas such as renewable energy, fisheries, shipping, marine security and surveillance and marine biotechnology. The international linkages and supporting mechanisms are being put in place so that technology companies, entrepreneurs and researchers will use Ireland as a test-bed to develop, test and validate these technologies through leveraging its unique geographical location, world-class expertise and infrastructure.